Welcome Funds is a professional life settlement broker that is licensed to represent policy owners & secure the best offers from the secondary market. Contact us for a Free Consultation with No Obligation. If you are going to sell a valuable personal asset, like your home, would you sell it to the first person who made you an offer? Hopefully not. You'd hire a professional real estate agent experienced in your local area to help you secure the best offer from a qualified purchaser. Life Settlements are very similar to the process of selling a home. You need an experienced professional to navigate the market and negotiate with the most qualified buyers that are interested in purchasing your life insurance policy. Buyers have different interests, price points and objectives and those differences often result in a wide range of offers. Our team of dedicated professionals has negotiated more than 10,000 life settlement offers through our National Funding Network that consists of the top buyers in the market. We simplify the bidding process by creating an auction where these state licensed financial institutions compete to purchase life insurance policies. The following is a sample of our life settlement auction and negotiation process. This example is for illustrative and educational purposes only and is not intended to predict the level of competition or pricing for any future transaction. 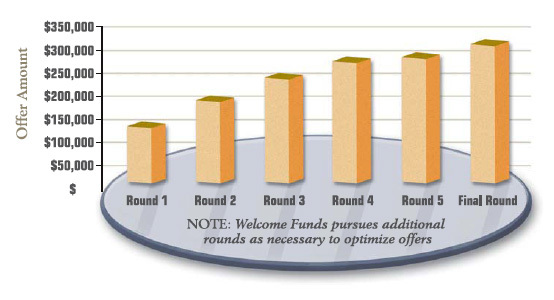 The following chart summarizes the bidding process for each round of negotiations. Our team informs each buyer of the competitive bidding and continues the process as long as necessary to identify the highest bidder. Example: Policy face value = $1,250,000. The number of state licensed financial institutions that are available to make offers will vary from state to state depending on specific legislation in each jurisdiction. Have Questions? 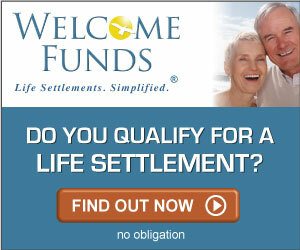 Give us a call at 1.877.227.4484 for a Free Consultation or you can find out if you qualify for a life settlement using our Quick Online Qualifier - it's fast, easy and there are no obligations at any time.